“Homesteading 101 Philippines Property Perils” is a detailed look at problems you might encounter as a foreigner when it comes to property issues. In contrast to what you may be used to in your home country, property issues in the Philippines are fraught with pitfalls. Let’s take a look at some of the obstacles you could face. Foreign Land Ownership Philippines Non-Existent? First of all, is foreign land ownership in the Philippines non-existent? Though sometimes a point of contention among some expats, the law is very clear on the issue. In contrast, foreigners may purchase and own CONDOMINIUM UNITS built on Philippine soil. However, they cannot own the land that the condo unit sits on. 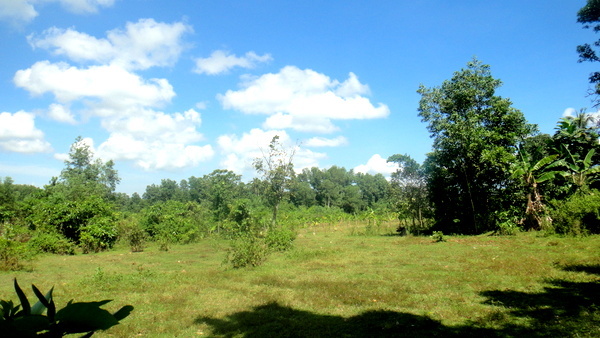 Who Can Own Land in the Philippines? Those who claim that foreigners can own a house and lot in the Philippines most likely have a condominium title to their property. 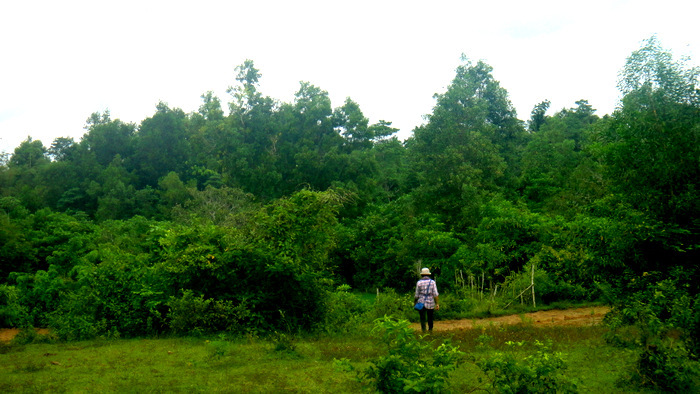 Again, by law, foreigners don’t have the right to acquire land in the Philippines. The simplest way for a foreigner to acquire real estate properties is to have a Filipino spouse purchase a property in his/her name. Consequently, if you put the property in the name of your Filipino boyfriend or girlfriend, you’re playing a risky game. If that person leaves you, you’re up a certain creek without a paddle. Land can be leased by the foreigner or a foreign corporation on a long-term contract for an initial 50-year period and renewable every 25 years. A foreigner can rent a lot and at the same time legally own the house on the rented land. The aforementioned information was provided by Global Property Guide and Platon Martinez Flores San Pedro Leaño Law Offices. My wife has three pieces of property in her name. One of those lots was purchased before we were married. 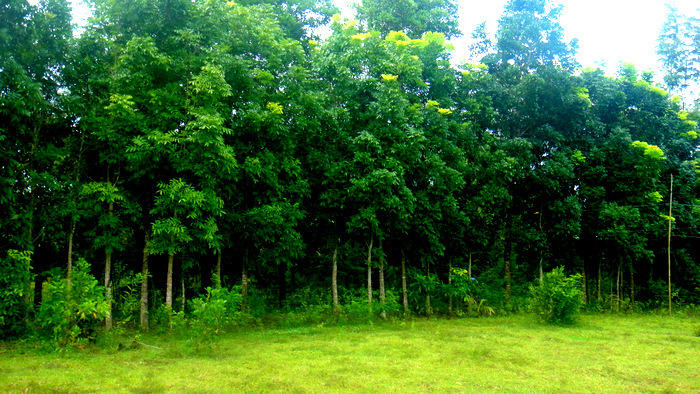 I have my name on our deed of sale for the new lots but not on the title of our new property. It made absolutely no sense for me to have my name listed on the property, since I cannot own any land in the Philippines anyway. I have spoken to a foreigner who claims to have his name on a property title, at an additional cost, of 10,000 pesos, 200 US dollars. However, it turns out he doesn’t even a copy of the seller’s clear title to the lot after six years let alone his own clear title. Perhaps the man was confused and meant his deed of sale and not title. Save yourself a lot of grief. Put the title in your Filipina spouse’s name if you’re a foreigner. Consequently, BOTH brothers that sold us our two lots we currently live on both gave us the ORIGINAL clear title to the property after we looked at the lots and agreed to purchase them. In fact, we had possession of those two clear titles once we completed a LEGAL DEED OF SALE with one of the most reliable attorneys on our island province of Guimaras. We also had multiple witnesses to the signing of the deed of sale. While one of the lots had a 35,000 peso overdue tax bill, 700 US dollars, the seller paid the bill the same day we agreed to purchase his lot. He also gave us the official, original copy of the paid tax bill. The brother works in the States and was unable to get the bill paid on time. Not paying your property taxes in the Philippines, at least not in Guimaras, doesn’t seem to be a problem. Personally, I’ve never heard of anyone having a lien placed on their property on our island province for non-payment of taxes, but I certainly wouldn’t risk it myself. Our brother-in-law has handled the title transfer of our two lots and has accomplished the task in a little over two years. It takes time going to the different offices that need to sign off on the transfer. The process is exceedingly long. There’s a reason why the Philippines is continually ranked as one of the worst countries on the planet for transacting business. You’ll run into more twists than a pretzel factory. Despite President Duterte’s determined efforts to slash red tape, the new process hasn’t evidently spilled over into our province yet. Personally, I didn’t want any involvement in the title transfer process whatsoever. However, there was one exception. I only intervened once. We needed a copy of our initial survey receipt. While I turned over all of our receipts and related paperwork to our brother-in-law, for some reason the original receipt which listed the cost of the survey had gone missing. The surveyor was not at his office in Iloilo City, but the surveying office did have the man’s number. He lived out in Iloilo province. Furthermore, no one seemed able to reach him though my wife and brother-in-law had tried numerous times. This was going on for days. Finally, I had enough. The Crusty Old Expat interceded. “Let me see your phone,” I said to my asawa. She quickly handed it to me seeing as I was visibly annoyed. Being “visibly annoyed” is a common trait of The Crusty Old Expat. I dialed the number around 7 o’clock in the evening. The phone rang. Someone picked it up. It was the surveyor. He was home. I handed the phone back to my spouse. The receipt for the survey was available the next day at the Iloilo City office. One thing, aside from a clear title, to look for when buying a property in the province, like we did, is your proximity to establishing an electrical hook-up with your local utility provider. You can end up paying thousands of pesos depending on how far the power company has to go to establish your service. Fortunately, the brothers that sold us our lots has an auntie who lives nearby. The auntie graciously allowed us access to the main transformer located on her lot. Consequently, it saved us a bundle of money. 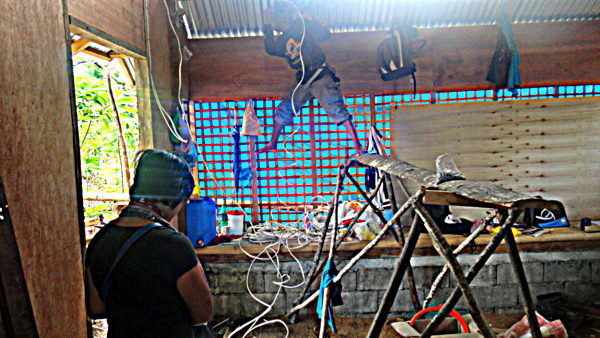 My brother-in-law first ran the line from the main power source to my father-in-law’s nipa hut we had built on our property. That line runs approximately 600 meters or so. After three missed appointments from the utility company’s chief engineer, I found it necessary to visit the utility’s main office myself. The office’s Chief of Staff graciously met with me and the engineer hooked up electrical service for us the next day. Yes, another Crusty Old Expat intervention. This helpful official did not take one centavo for assisting us, which I greatly appreciated. It’s also essential that you have proof in writing of any right-of-way access to your property in the Philippines. Please, don’t take the seller’s word for it. Our sellers showed us proof in writing as to avoid any possible future conflicts. We know of some instances where property owners trying to sell their lots have claimed that access to their property isn’t limited. However, it turns out that the private road to the lot being sold ran across someone else’s property. If you don’t obtain right-of-way access in writing, you might be screwed. Needless to say, you’re not in Kansas anymore once you retire to the Philippines. Public and private roads on our island province of Guimaras are fair to poor, especially depending on whether it’s the rainy season or not. For some reason, roads that were widened only a few years ago, are torn up and paved again. 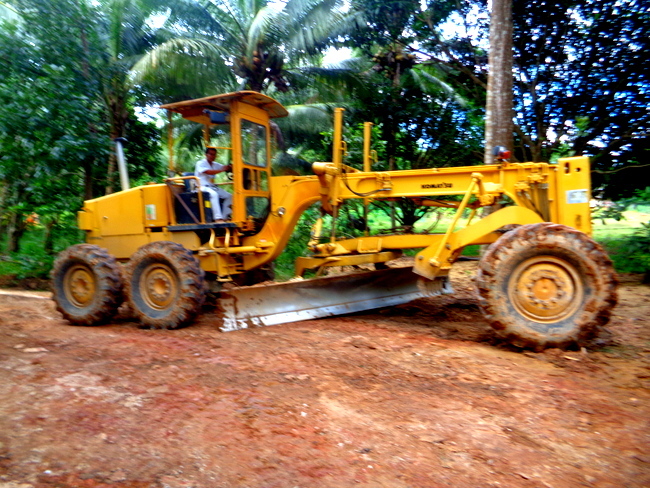 There is one main contractor on our island who owns the bulk of the heavy equipment for the road improvement projects. I suspect he doesn’t mind these new undertakings. Why? Not because of any security issues but I slapped that moniker on it because a total of 13 people occupied the premises at one time. Our “subdivision’s” avenue? A muddy, cow-poop-laden road. No street lights but plenty of cow manure. Today, the road has a thick layer of white rock on it. A couple of years ago during the rainy season our local road, which is a public road, became impassable. I reached out to our local barangay captain who informed me their was “no budget” to repair the road. After making a subsequent visit to the barangay hall for another matter, I asked our kapitan again about the road. I received another “no budget” reply. As the rainy season progressed, the road worsened. We had to use an alternate route and go in the opposite direction to reach the market at San Miguel, Jordan. A one-way trip that used to take 10 minutes now took 20 minutes longer one way. Hence, the round trip now took 40 minutes longer. This was unacceptable to me. Paved road would be fantastic. However I wasn’t asking for that. 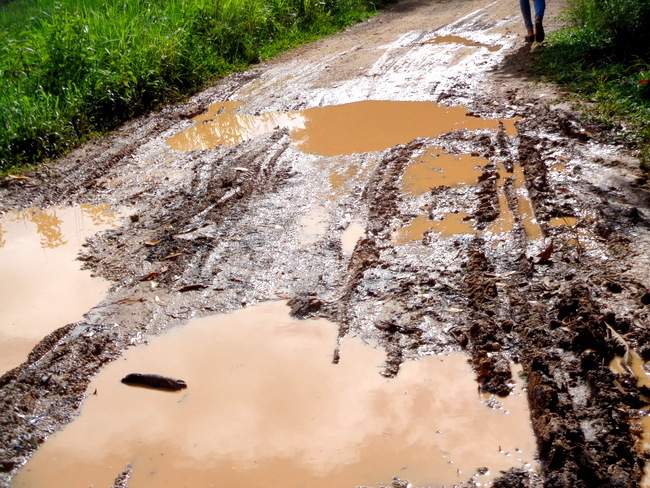 It now consisted of mud with huge ruts caused by large trucks and jeepneys that used the thoroughfare. Therefore, I visited our local mayor’s office. We waited for more than 90 minutes. No mayor. He was in Iloilo City. I did manage to speak to another city official who promised some white rock to help with temporary repairs. However, the rock delivered wasn’t enough to cover one small pothole. Hence, in desperation, I paid a visit to our Governor’s Office. With the help of Jaypee, the Public Information Office for our province, and the Governor, along with the road crew, our road was made passable until the following rainy season. White rock was spread over the severely muddy areas and we were able to take our short route to the local market and Jordan Wharf. We certainly appreciated the Governor’s Office help. However, last year our street became extremely difficult to navigate again. In fact, conditions were so bad at one point during the rainy season, that we couldn’t even drive our Ford Ranger at all for two weeks. The alternate path we had used the year before, the long way, was also impassable. We also had problems even making it to the main road to catch a ride on a local tricycle. A massive pool of water stood in a gigantic pothole near the main motorway’s entrance. We needed more repairs. Unfortunately, at the time, there was no fuel budget available for any grading equipment and heavy duty trucks. Consequently, the situation became so severe, I decided to pay Jaypee another visit at the Governor’s Office. He listened patiently to my concerns and immediately tried to contact the Chief Provincial Engineer on his cell phone. The Chief’s phone rang and rang. No one answered. Therefore, we paid a visit to the new office complex for the Engineering Department. After speaking with the Chief, we received a promise to fix our road as fuel funds had just become available. A heavy layer of white rock was eventually laid, some of it during a intense downpour of rain. My wife heard through a young woman who worked in an erstwhile local eatery that our road was to be widened in November 2018. While we were excited to hear that our road would finally be paved with concrete, we didn’t hold any hope for it happening any time soon. November passed. December passed. Then, about two weeks ago, we heard the sound of heavy equipment and big trucks rumbling close by. Was this the new paving project? My asawa went outside to find out. No, to our bitter disappointment the road was being paved but not in our direction. I sent a text message to the Chief Provincial Engineer asking if our section of the same road would be paved. Two weeks later I received a reply. The Chief apologized for the late reply. Unfortunately our section of the road would not be covered in any 2019 improvements. However, the Chief promised to try and get our road included in the Governor’s list of 2020 Projects. So we will have to wait and see. The road is passable at the moment, the rainy season is long over. Hopefully, in May or June, when the rainy season begins, the layer of white rock spread last year will hold. It’s so dry now, however, that even the catfish are carrying canteens. If you’ve lived as an expat in the Philippines for any amount of time, you’ll know that patience is something you need an abundant supply of. Yes, we could have purchased a 4-wheel-drive vehicle when we bought our Ford Ranger. Due to the fact that I didn’t want to pay an additional 500,00 pesos, 10,000 US dollars, for that option, we didn’t. OK, let’s round-up the topics covered in this post, Pardners, Yee-haw!!! Can a Foreigner Own Private Property in the Philippines? Alright, time for The Crusty Old Expat to mosey on down to the chuck wagon for some breakfast. Remember, keep your saddle oiled and your gun greased.